Almost missed this one. 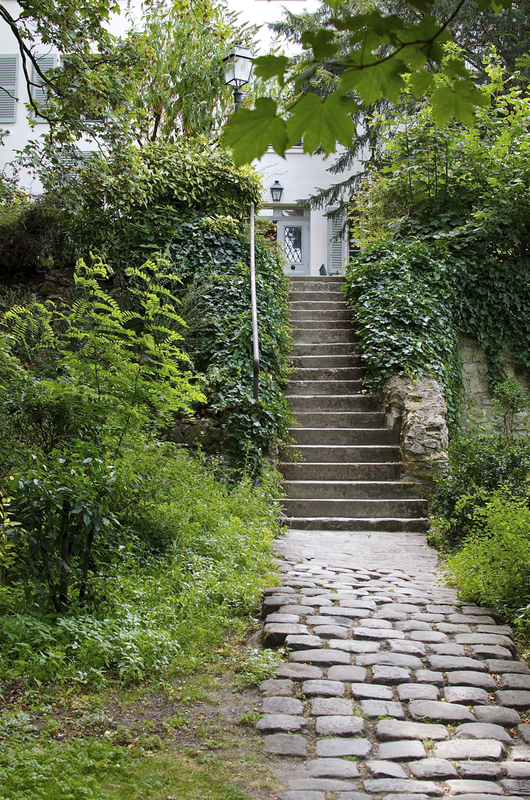 Musée Montmartre was high on my list, but the first time I went, I got off at Lamarck-Coulaincourt, climbed the 92 steps up from the Metro, followed the arrows pointing to the Musée, and got lost. Very lost. Wound up somehow on Boulevard Rochechouart, where it was a mob scene. Nasty, with THRONGS of people pressing up against me and shady guys trying to hand me stuff, way worse than Marché aux Puces Cligancourt. Trust me, this is a place where you don’t want to get lost. Famous for pickpockets. So I pulled my purse really tight under my arm, put on my most confident Frenchwoman scowl, and started fighting my way through the swarms of people. After a few blocks, I crossed over to the meridian, which was not as crowded. I then spotted the Anvers Metro and got the hell out of there. One of only two times in Paris where I’ve been concerned about my safety. Lesson learned: never wing it on the directions, particularly if it looks complicated, and never anywhere near Montmartre or Pigalle. Honestly, I was unnerved enough by the experience that I wasn’t sure I wanted to go back. 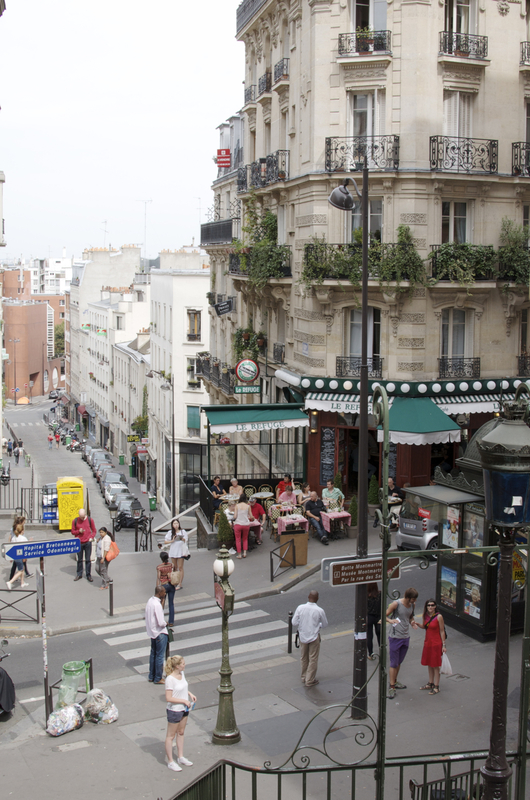 What if that whole area of Montmartre was like that? But after thinking about it, I remembered the area where I’d initially gotten off the Metro wasn’t bad at all. Maybe I should give it another try, with complete directions and the compass. On a weekday, not a Saturday. So glad I did. Absolutely loved it, one of my favorite places I’ve been. Though, after seven weeks here, I’ll admit that list is getting long. View of where the Metro stop is here, from above. 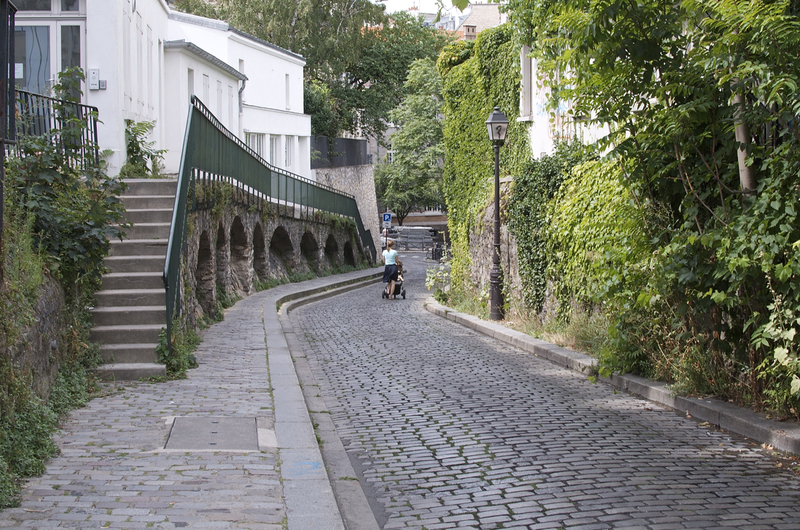 If you decide to go, just be aware that the journey from the Lamarck-Coulaincourt station is all uphill. Lots of stairs. And also a good walk of about 10 blocks on a steep incline. If you’ve got any foot or health issues, this might be one where you invest in a taxi. This time, I navigate Lamarck-Coulaincourt better. I look for, and find, an alternative to the 92 steps up. There’s an elevator here, something I’ve never encountered in a small station. It’s a weird elevator; large, irregularly shaped and very dark. You definitely feel like you’re rising through the bowels of the earth. It moves very slowly, and I find myself wondering what would happen if it stopped functioning. My thoughts turn dark. Very very dark. Like … gas chamber dark. And then, after an interminably long pause, the back door of the elevator groans open and I disembark, heading out into the sunlight and the street. Road leading up to the museum. This time, with compass and Google walking directions in hand, I look for the road North. Except there are only three roads and they go South, East and West. I look again. There are two flights of stairs in the area that is North and there looks to be another road up there. I decide to give it a try and head up. Drat, no street signs. Previous experience in mind, I cautiously walk around for about 5 minutes and finally spot a sign. Joy! It’s the correct road. I head up on my way, everything falling into place this time, and I immediately start to relax (well, except for my calves, because they’re getting a workout). This area is actually charming! I make it to the museum in about 10 minutes, despite the street signs in this area remaining sparse. I can see the Sacré-Cœur in the background. I enter the museum, pay my 10E, and walk into a charming courtyard. 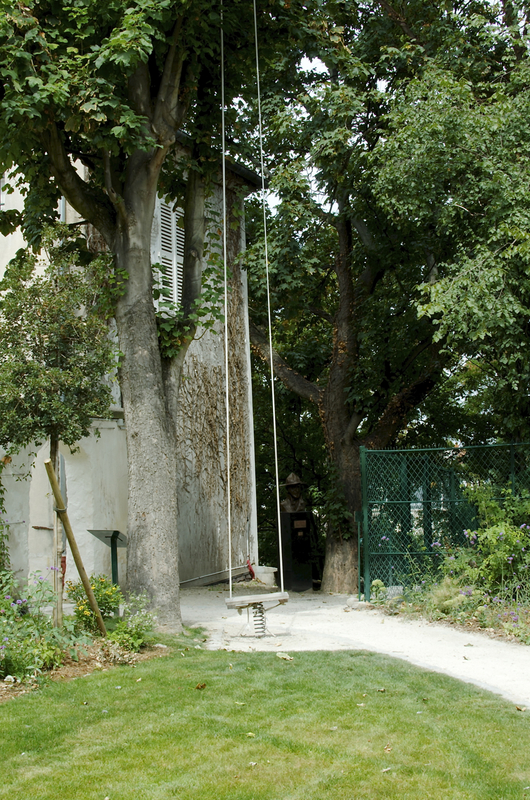 A lovely garden and grounds surround the museum, which is the oldest house in Montmartre, recently restored and turned into this thoughtfully conceived and delightful museum. As a budding painter myself, there is something they have done here that I absolutely love: they put placards in the gardens (in both French and English) where famous paintings happened. I learn that Renoir painted here. I love Renoir, especially his landscapes. I know he’s famous for his portraits, but I like his landscapes better. And now I get to stand in the very place where he painted “The Swing.” This makes me feel a little teary and a lot fortunate, so I sit down on the bench for a bit to reflect. 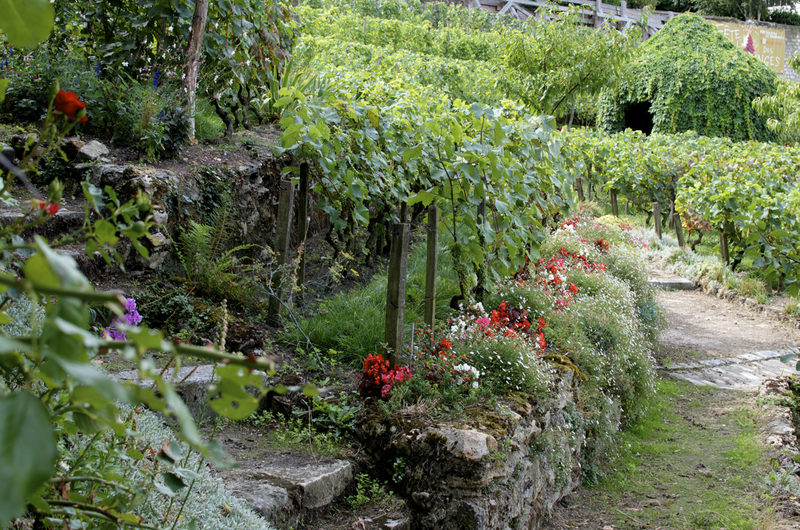 I continue through the gardens, which you must do before you enter the museum. And why wouldn’t you want to? They’re sublime. 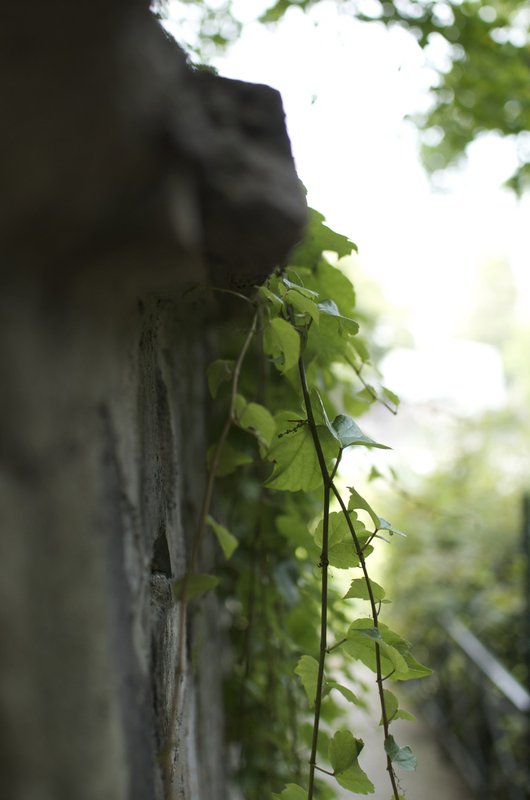 Tumbling ivy. Gobs of color. Wild, uncontrolled old trees. 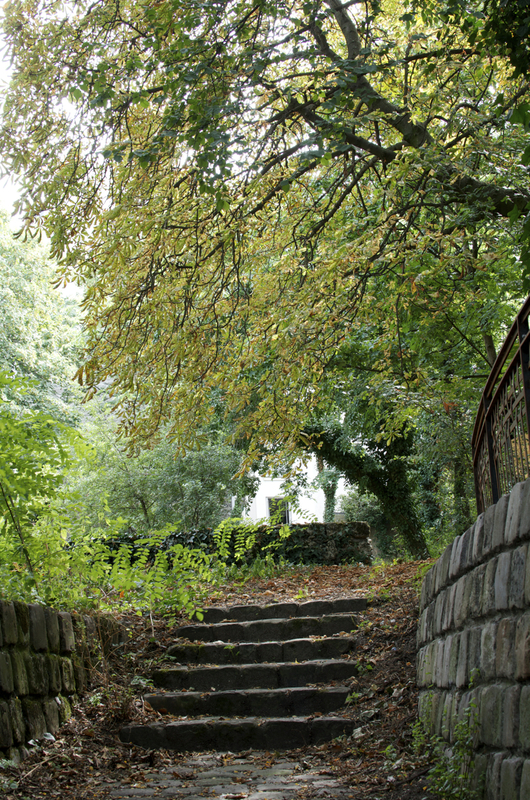 Rambling pathways. I can see in a heartbeat why so many great painters wanted to paint here. After spending more time in the garden than any normal human being would, I finally head inside to the museum. And here is the surprise to me: the artwork is good. Generally in the small museums I’ve been in in Paris, the buildings are great, but the quality of the artwork really drops off. Not the case here. 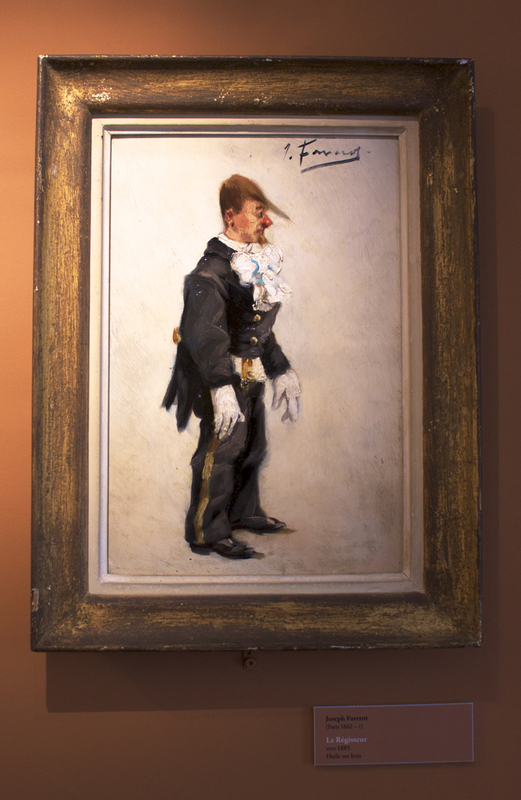 Some wonderful paintings, though not by hugely famous painters. This doesn’t bother me in the slightest; I’m more interested in the quality of the work than the renown of the artist. The works here are all Montmartre-focused. 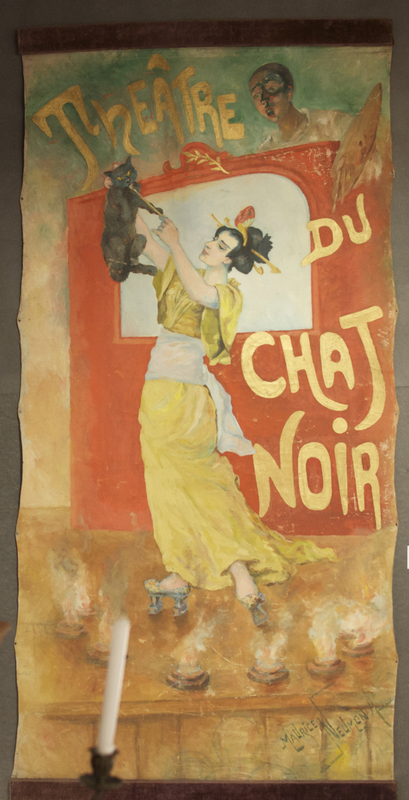 There are also many excellent posters, sketches and magazine covers, as Montmartre was the home of the most famous poster of all, Le Chat Noir by Steinlen. 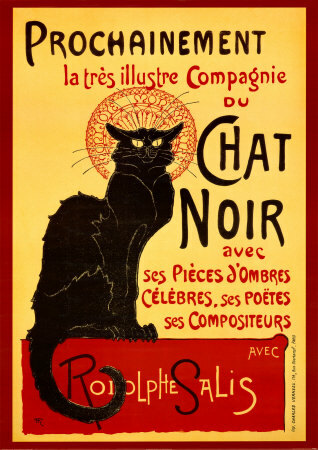 There are sketches by Steinlen and other famous poster artists including Toulouse Latrec and Cheret. Wonderful photos, too. I loved seeing photos of the artists. Illuminating. 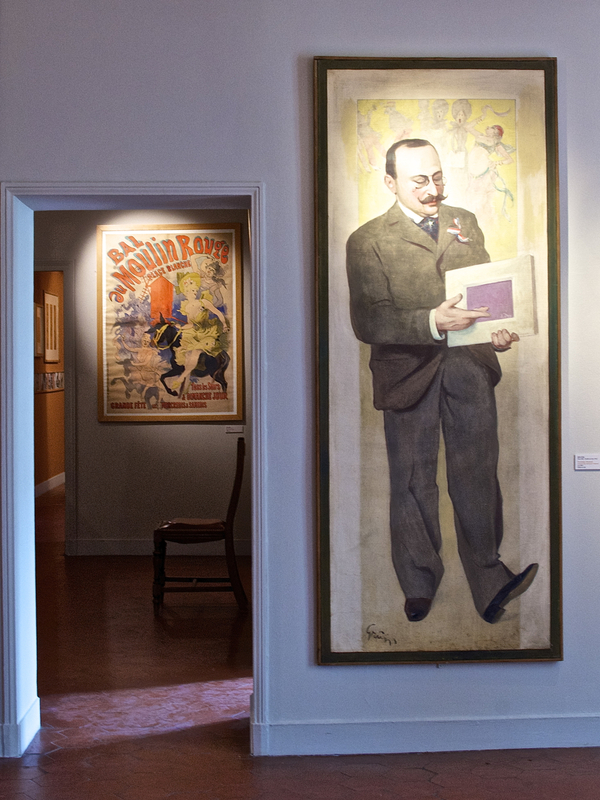 The museum creatively and thoroughly gives the history of the area through the art. At the time when most of the now-famous artistic scene was happening here, Montmartre was an area teeming with the poor, scandalous entertainment and prostitution. I don’t believe there is an audio tour in this museum, but all the plaques are in English. This is my favorite. No germ-y headphones filling my brain. Just a plaque I can read when I feel ready. Love it. Added bonus: the museum was not crowded. I am intrigued by many of the posters. I photograph the lesser-known ones. Having done a lot of searching for old posters, I know how poorly documented they are. They will be impossible to google later without very specific information on them. Maybe even with specific information. I think posters from 1890 to about 1945 are a magnificent art form, and it’s sad how much of it has been lost to us forever. Most people would do this museum in about 45 minutes. But as a quasi-artist and a lover of photography, gardening and nouveau posters … what can I say, I’m there about 2 hours. Enough to make the museum folks think I’m either a thief or a freak. I’ll settle for freak. Enriched and a little exhausted, I emerge from the museum and sit on another bench in the courtyard, enjoying the view. Montmartre is high on a hill, and you can see the rest of Paris in a mist below. I think about standing on the bench to get more of the city in the shot, but it’s a wood bench, and I didn’t want to be one of “those” tourists. 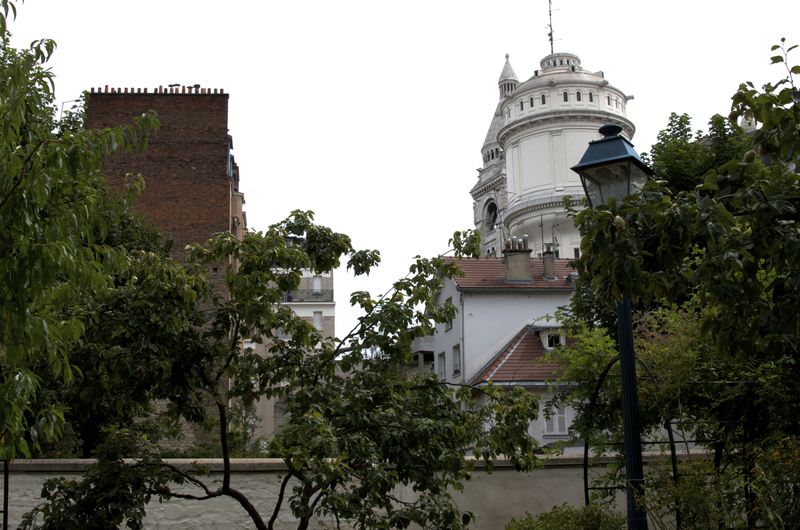 View from courtyard of Musée Montmarte; rest of Paris in the distance below. On my way out, I see some of those tourists attempting to photograph the garden through the fence, apparently too cheap, too oblivious or too time-crunched to bother going in. I sigh and think that this is a gross error in judgment on their parts. They missed out, but I get to hold this museum in my heart forever. Kisses, and a big thumbs up! Complete gallery with additional images not in the post below. Story thoughtfully laid out and told, with a series of photos below. 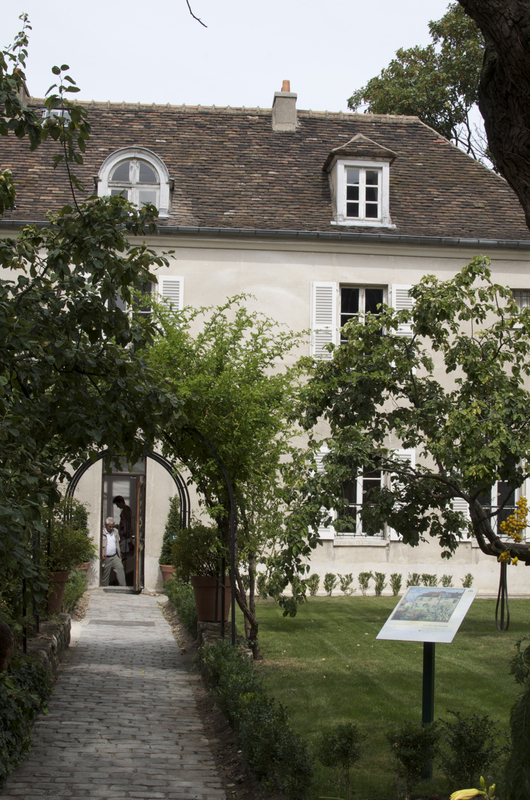 View of the museum, which is the oldest house in Montmartre, refurbished. View of the courtyard from inside the museum, which was originally a home. 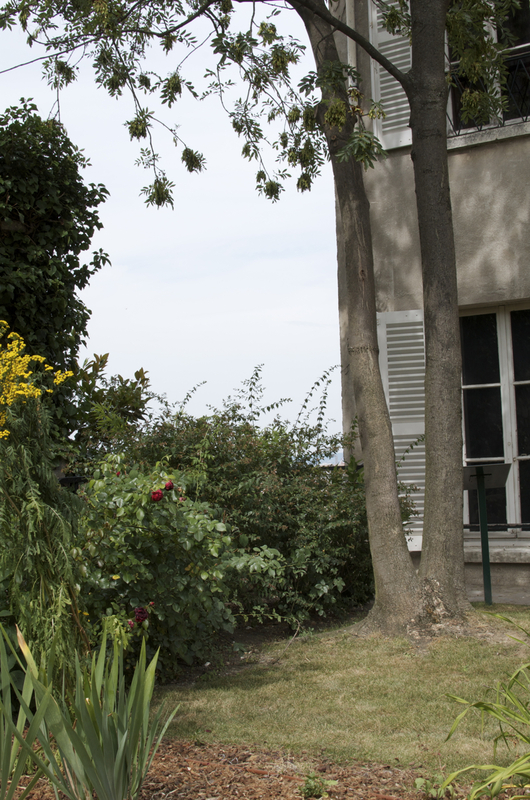 View from the garden of the Musée Montmarte, the rest of Paris off in the distance below. View from the entrance of the Musée Montmartre, Sacré-Cœur in the background. Rue Cortot, where the museum is. Rue Saint-Vincent, leading up to the museum. This would have been one of my favorite places.